They’re small, fast, elusive and disappear quickly, but that’s part of what makes quail hunting fun and, occasionally, frustrating. For those who have not been out on a quail hunt recently, it may be time to reconsider. Quail populations are highly dependent on precipitation and, in recent years, New Mexico has seen improved snow and rain accumulations. While quail populations will dwindle during times of drought, they rebound quickly when precipitation begins to fall during specific times of the year, such as winter and spring for Gambel’s quail. Regardless of their abundance, it’s import-ant to spend time in the field and under-stand the best places to go. Personally, I like to spend four weekends every year chasing what I affectionately like to call “nitro birds” around some of my favorite spots. This past season my wife and I only had an opportunity to spend one weekend in the field, and it was near the end of the season. That should be among the top five rules to follow: If possible, avoid the end of the quail hunting season. Later in the season is just not a good idea. By this time the birds have been educated due to hunting pressure and have no intentions of sticking around to give a hunter a shot. With the first blast the birds fly and the moment they land they’re running hard. In considering conservation, hunters might think twice about shooting at smaller coveys to leave plenty of quail for the following season, a lesson learned from my father growing up in Artesia. Small coveys weren’t the case last season as quail were found in groups ranging anywhere from 15 to 50 birds. Despite the late-season difficulties and only one week-end in the field, hunting was still good and a number of birds were harvested. “What a great year for hunting quail. It seemed like there was a covey around every corner,” said Chris Pruitt, an avid quail hunter from Artesia. Gambel’s quail. Those longing to hunt should consider southeast New Mexico. New Mexico has more than one area that is great for hunting these birds, but those wanting to bring home some wholesome quail meat for the table should consider the southeastern part of the state. The best area last season was in the oilfield east of Artesia in an area just south of Carlsbad north to Dexter. The area was loaded with scaled quail. Not only were there a lot of birds, but the area is also predominately public land owned by the Bureau of Land Management along with State Trust Land. The far east side of New Mexico, from Jal to Clovis, was average with the exception of the area north and west of Jal up to Maljamar. This area consistently produces a good number of birds. Although there is more private land, plenty of BLM and state land is available to hunt. Another great place that consistently produces a good number of birds is the BLM and state land south of Hope. However, southeastern New Mexico isn’t the only place with good populations and great hunting; the southwestern portion of the state has several species. The three species found in the southwest are Gambel’s, scaled and Montezuma. 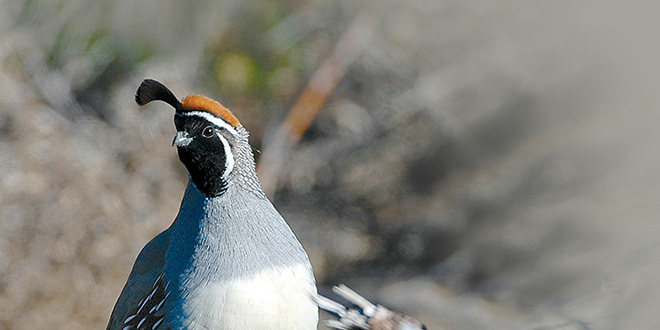 Everything from Las Cruces west to Lordsburg and north to Hatch produce both Gambel’s and scaled quail. To be a little more specific, the BLM and state land in and around the Las Uvas Mountains Wilderness Study Area. Other areas to explore includes all of the BLM and state land west of Las Cruces near the Portrillo Mountains and all of the BLM and state land south of and between Deming and Lordsburg. Although these areas didn’t have as many birds as the southeast, there were still plenty for a great hunting experience. So, dust off the shotgun, get the bird dog ready and practice up on a few clay pigeons. Forecasting quail abundance can be a bit like predicting the wexather, but regardless of their numbers, quail hunting provides a wonderful opportunity for families to spend time together in the outdoors. It’s been a hot, dry year in New Mexico and quail seem to be taking a hit after a boom in 2015. The spring began on a positive note because the majority of quail overwintered fairly well. However, hot temperatures, mixed with below-average spring and summer precipitation, quickly reduced the hopes of another above-average production year. Reports from the western portion of the state indicate adult quail numbers are down with fewer broods than last year. While below average winter and spring precipitation suggest quail numbers will be average following a boom in 2015, expectations for a good hunting season remain high in the southeastern portion of New Mexico. 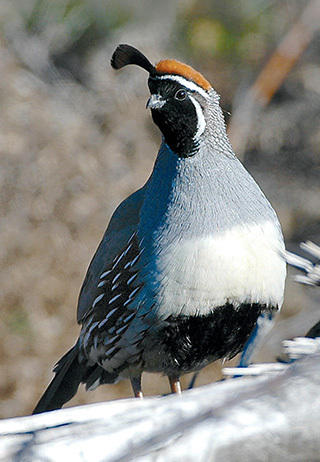 In addition to the southeastern area, New Mexico sports Gambel’s, Montezuma, and scaled quail in the southwest and visiting locations from Las Cruces west to Lordsburg and north to Hatch might result in a fulfilling hunt. Scaled quail. NMDGF photo by Dan Williams. Anecdotal reports in the southeast suggest above-average numbers of quail. Both bob-white and scaled quail numbers are up after a high reproduction year in 2015. 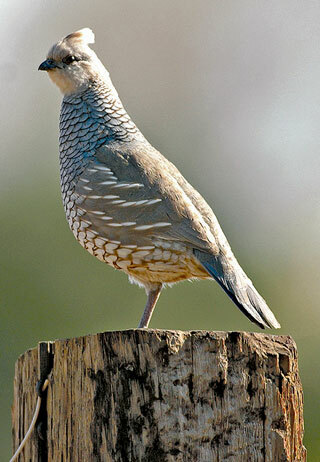 Addition-ally, spring reports of Montezuma quail in the Sacramento, Capitan, and San Mateo Mountains were encouraging. Coming off of an exceptional 2015-16 hunting season, this appears to be more of an average hunting year. There will be good hunting opportunities in pockets across the state, with continued above-average hunting in the southeast corner. New Mexico’s resident upland games species include: Quail, Dusky grouse, Pheasant, Eurasian collared-doves, and several Squirrel species. For more info see the Upland Game page on the New Mexico Department of Game and Fish main website. 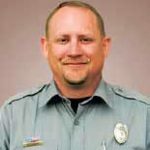 Ross Morgan is the Department of Game and Fish public information officer and conservation officer for the Northwest Area. He can be reached in Albuquerque at (505) 222-4707 or ross.morgan@state.nm.us.